As a fundraiser to help with Herron Center expenses, the Herron Center is selling memory bricks to create a sidewalk from the old school to the “swinging girls” statue recently added to the school playground (the Herron Center grounds). These paving bricks will be custom imprinted with names of Herron Center supporters, former students, those who attended Head Start here, former teachers and Board members, etc. 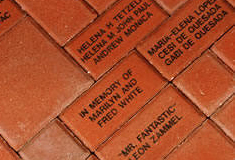 Anybody can purchase bricks in honor or in memory of others, or as a gift that will remain with the Herron Center forever. Bricks cost $50 each. Just click here to display the memory brick order form, print out as many copies as you need, indicate what text you want us to print onto the brick, and send in the form with your check. We hope to begin the sidewalk construction project soon, but we’ll be able to keep adding more bricks in the future.